Anil Gupta is the author of, “Immediate Happiness: Be Happy NOW Using Practical Steps with Immediate Proven Results.” He joins the podcast to discuss his strategies to living a happy life. 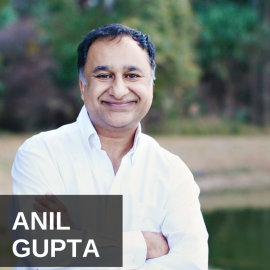 Anil Gupta is an electrifying catalyst for profound healing who has devoted his life to helping people rise out of pain and blockage into overflowing abundance and meaning. He has a gift for identifying blocks and patterns that are keeping a person stuck and uses his advanced intuitive gifts to reconnect people with their spirit, truth and life’s purpose. Anil literally wakes up people’s souls to living so they realize their greatness. “My ability is to take what is deeply rooted or spiritual and then translate it into practical tools to assist people in creating the lives that they want. Seeing them receive immediate results and healing is what inspires me to continue my work.” said Gupta. Anil believes his greatest gift is teaching. He has been teaching and speaking since 1998. Anil Gupta has received many written and video testimonials for how his work has changed their lives. He has a way to engage his audience with his clear, concise and candid speaking style. What Anil says makes sense. His words have an immediate, transforming effect on the audience. Anil’s programs offer both immediate release as well as long lasting change. What he offers is much more than a temporary fix, instead you leave his seminar feeling a profound shift in the way you see relationships. Get “Immediate Happiness” at www.ImmediateHappiness.com. Jason Hartman: Welcome to today’s show. This is Jason Hartman, your host. And as you may or may not know, every tenth show we kind of do a special tradition here that originated with my Creating Wealth show where we do a topic that is kind of off topic on purpose. Something just to do with general life and more successful living. And that’s exactly what we’re going to do today with our special guest. Again, tenth show is off topic and it is very much intentional just for personal enrichment and I hope you enjoy today’s show. And we will be back with our guest in just a moment. Narrator: What’s great about the shows you’ll find on JasonHartman.com is if you want to learn about investing in and managing income properties for college students, there’s a show for that. If you want to learn how to get noticed online and in social media, there’s a show for that. If you want to save on life’s largest expense, there’s a show for that. And if you’d like to know about America’s crime of the century, there’s even a show for that. Yep, there’s a show for just about anything, only from JasonHartman.com or type in “Jason Hartman” in the iTunes store. Jason Hartman: It’s my pleasure to welcome my friend Anil Gupta to the show. He is the author of Immediate Happiness, and he is an expert in creating awareness, joy, presence in one’s life and I just think you’ll really be inspired by this interview. Anil welcome, how are you? Anil Gupta: I’m very blessed, thank you for asking. And how are you? Jason Hartman: Well good. It’s good to have you on the show, and of course we’ve talked many times and I’ve been wanting to do this interview for a while and share your wisdom with our listeners. Where are you located, by the way? I always like to give our listeners a sense of geography. Anil Gupta: I’m in Sunny Orlando, Florida. So I’m enjoying the weather right now. Jason Hartman: Alright, fantastic. Well when you wrote immediate happiness, what inspired you to write the book? Anil Gupta: What happened was that I knew a lot of ways to get into a better emotional, physical and mental state but I couldn’t apply it. So I wanted to write something where people could apply their knowledge immediately and practically with a proven methodology. So that’s why I wrote it. There’s no fluff in the book, it’s very simple and it’s from the heart. People think knowledge is power but it’s not without implementation. So this book is really about implementation. Jason Hartman: Fantastic. Well, I’ve long said that knowledge just won’t do the job alone. Knowledge and action which in use is the definition of wisdom, so good. What are some of the specific implementable things that people can do to create more happiness and joy in their lives? Anil Gupta: I’ve developed a three pathway to fulfillment program. If I could share the three pathways, if you do these three things you will feel better, you will look better, you will show up differently, you’ll be happy and above all else, fulfilled. And they’re very simple things to do, so may I share those with you? Jason Hartman: Absolutely. I’m waiting with bated breath. Anil Gupta: The first thing is, and I call them the three G’s. The first G is Grow. You have to grow emotionally, physically, spiritually and mentally. You have to go to the gym, you have to clean out your thoughts, you have to change the way you think, you have to change the way you show up in the world, you have to be kinder and more gentle. So that’s the first G. The second G is be Grateful. Be grateful for what you have and don’t focus on what you don’t have. And the third G is Give. Give your time, your energy, your love, your compassion, your greatness, your joy, your forgiveness, your spirit… give it away without wanting anything in return. If you do those three things Jason, I promise you that your life will change. Jason Hartman: That sounds fantastic. Now, when it comes to… and certainly everybody would agree with I think all three of those things, and all of the sub points you made for all of those things, but a lot of people get stuck in different parts of them and one area I especially see people getting stuck is in the area of changing their thoughts and their self-talk. They just have these destructive conversations with themselves inside their own head and you said change that. But some people, they’re stuck. How do they do that? Is it just literally a decision? Make a decision and change it and that’s it, or is there a technique for making the decision? Anil Gupta: Well really there is a technique. There’s one master discipline – if you master this one discipline your life will change and that’s the discipline of awareness. From awareness you get clarity, from clarity you get focus, from focus you get action and from action you get results. And ultimately results lead to success and happiness. And that’s what people think we are searching for, happiness, but it’s not. What we are searching for is fulfillment. So if you have awareness over the thoughts that you’re having and you’re aware of the thoughts and you’re aware of the destructive nature of the thoughts, you’re in a different place, a different position because you have more power. So once you have that awareness, once you have those thoughts coming into your head you have a choice. You can either let them run your life or you can run them. So the basic starting point is to have the awareness. And don’t resist the thoughts. They’ll always come up. Just observe them. Once you observe them they are powerless and they tend to disappear. So that’s the first step: bring awareness. Second step is don’t let them have power over you and the third step is just to observe them. Jason Hartman: Fantastic. Well talk to us about some of these destructive thoughts that people have. Obviously telling one’s self that they can’t do something is certainly limiting and destructive. Holding grudges, that can be destructive. Talk about some of those if you would. Anil Gupta: Well, to be honest Jason I have them too. I often feel that I’m not good enough, that I don’t belong, that there’s something wrong with me, that I’m not loved. And it’s okay to have those thoughts as long as you don’t live in that world. If I lived in a world that I’m not good enough, it’s not going to serve me and it’s not going to serve the people I’m around. And the most destructive thought is the thought of not forgiving people. If you’re not able to forgive people, that is the most destructive thought because your ability to let go, your ability to forgive will determine the quality of your life. Your quality of your life is dependent on the quality and the quantity of the forgiveness you’re able to extend in that life. Jason Hartman: I’ve talked a lot about the concept of forgiveness on different shows with different guests over the years, and why is that so important, as if I don’t know? Maybe you can answer that question. Anil Gupta: Okay. So Jason, you’re a smart guy correct? Jason Hartman: I think so. At least I’d like to think so. Anil Gupta: Okay, so tell me, would you take poison hoping someone else would die? Jason Hartman: Yeah that doesn’t work very well, does it? Anil Gupta: No. That’s what people do. That’s what forgiveness is. And there’s one very important part of forgiveness, you can forgive but you don’t have to forget. People think that if you forgive you have to forget, but that’s not true. For example, I coach a lot of people and I’ve coached them into forgiving their parents. And they’ve said I don’t want to, because if I forgive them I have to have a relationship with them. And I said no, you don’t have to. This isn’t about them, this is about you. This is about you letting go. You have the freedom to be yourself. You don’t have to forget what happened, but it doesn’t have to rule you. Jason Hartman: I would certainly agree, and many years ago I read a book by Dr. Laura. We’ve certainly all heard of Dr. Laura. I think it was entitled, How Could You Do That? And it was kind of an interesting take on the whole forgiveness subject, because as I’ve talked to different experts throughout the years and met people, I’ve talked to them about this and read about the concept of forgiveness… all of them say kind of the same thing of we’ve got to forgive people, it’s poisonous to have these thoughts eating at us, but she had kind of a different take where forgiveness isn’t the same as accountability. Can people still be held accountable and forgiven at the same time? Anil Gupta: Well the thing is forgiveness is the be all end all. And as human beings we love to be right, and if we hold people accountable, and we hold onto that at a very high level, it doesn’t serve us because then we get angry, we get upset, we make meaning to it. As human beings we are meaning making machines. So for example if my wife didn’t return my phone calls, I’d make it mean that I’m respected, I’m not loved, she doesn’t care about me. All that happened was she didn’t call me back. And if we have an accountability issue with someone, the same things are going to happen. So really, it’s something that if you just let go… it’s just like letting go of a football and letting it fall down. Just let it go. And that opens up so many beautiful thoughts, so many beautiful energies, so many beautiful lives. It is an incredible feeling. Jason Hartman: Yeah, sure does. Well, talk to us about some of the other elements. What are some of the other stuck areas where you see people really getting stuck? Anil Gupta: I can talk from my personal experience. A number of years ago I was in financial despair, I lost everything, and I was focusing on what I’d lost. And my wife, my angel, explained to me in very simple terms, this is what she said: Honey, I’m glad you lost it all. Wow. Jason Hartman: Wow. Talk about a mind shift. Anil Gupta: Why would you say that? She said look, you haven’t lost it all. You still have us, you still have the kids. And I thought, oh my goodness, I’ve been focusing on the wrong things. See, once we stop focusing on the wrong things, we live in that world. So that’s when my gratitude came. I was grateful that they were still with me, I’m grateful that they’re still around. I’m grateful that they were supportive to me. And that filled me up. Because if that wasn’t there I would have been in tremendous pain. Jason Hartman: Part of that reminds me of Viktor Frankl’s work in Man Search For Meaning. We always have the freedom to choose. He called that the last human freedom, the freedom to choose one’s thoughts. You said earlier that we are meaning making machines, and you used the example of your wife not calling you back. That could turn into oh, she doesn’t love me, she doesn’t care. But it’s just simple. She didn’t call you back. And you’d agree with that I’m sure, right? That that is our freedom, to choose what meaning we apply to things. Anil Gupta: It’s true. But the problem is that we haven’t developed that muscle, and we live in a world of unawareness. So let’s take the example of my wife not calling me back. So as human beings, we’re meaning making machines, as human beings we love to be right. So I have that thought that she doesn’t love me, she doesn’t care for me and she doesn’t respect me. Anything else that happens I reinforce being right. Look, there she goes again. I knew that she doesn’t care for me, I knew that she doesn’t respect me… look she’s doing it again. So once you have that awareness, you can let things go. But we need to develop that muscle, and that’s all it is. It’s a muscle. If we developed a muscle of kindness, generosity, acts of kindness, random acts of kindness, being happier… it compounds itself. I call it this compounding happiness. If you’re 1% happier, 1% more caring, 1% more joyful, 1% more generous, imagine what it would be like after a week, a month, a year. Jason Hartman: Yeah, amazing shifts can take place. I like the way you use the analogy of developing a muscle. To develop physical muscles we work out, we exercise, we exert ourselves. We do hard things because it strengthens us. How do we develop these muscles? What do we do? What’s the workout program? Anil Gupta: Okay. So it starts from awareness. You have to become aware, then after you become aware you become aware of being aware. So once you’re aware you can develop these muscles, but how do you become aware? So I’ve got a very simple technique your listeners can implement immediately. So if you get a handkerchief, tie a knot in it, put it in your pocket, every time you feel that handkerchief, every time you touch it, every time you notice it say to yourself why is that there? Oh yes, of course. I have to be more aware. You can put a post it note on your computer saying Be Aware. You can have your iPhone or your phone make a noise every two to three hours – that will remind you to be aware. I wear a wrist band on my wrist which says the word awareness, and it’s got GGG-Give, Grow, and Gratitude. So that’s something that people can start with. As you build that muscle you become more and more aware. So once you become aware, you can take action and you have more control. Jason Hartman: Very good point. That reminds me when my last dog passed away, I was very sad. I just couldn’t believe the level of sadness I was experiencing. And I actually talked to a grief counselor and he said one of the things you can do, and it just sounded so silly to me, but is that kind of reminder concept of every time you have a sad feeling, because you want to work through and process the emotions or at least that what you want to do according to him, you may well disagree. He said one technique is simply put a rubber band on your wrist, and every time the thought or the feeling comes up, snap it just to bring your attention back to it and process it more successfully. Are things like that gimmicks or do they have real value? Anil Gupta: I think there’s great value in them because it does increase your level of awareness. And that’s the secret. Once you become aware of your thoughts, you can change your thoughts. Instead of focusing on the things that were sad, you can focus on the things that were great. Imagine that you are going through with a divorce. What people do is focus on the things that are not working. They have many years of beautiful marriage, but they do not even think of those beautiful times or the beautiful kids that they have nurtured in that time period. So they focus on the things that are not working. If they focus on the great moments that they’ve had, the divorce may still happen but it’ll be amicable, it will be friendly, and there’ll be no anger, no hatred. From anger and hatred you always get illness. So the circumstances don’t change, but how you look at them changes. Jason Hartman: That perspective. That last human freedom. It certainly does and I totally agree with you about the part that it will make you sick. Thoughts can make you sick. It’s that psychosomatic medicine, and that is so important. And it’s kind of this downward spiral isn’t it? Where we get sometimes within ourselves with this chain going, and we think the thought and we give meaning to it, and the meaning is a meaning that doesn’t serve us, and then that leads to another thought or another feeling, and maybe the feeling is emotional or maybe it’s actually a physical feeling of sickness. Breaking that chain and interrupting that pattern, that’s vitally important, isn’t it? Jason Hartman: Some people don’t have that. Jason Hartman: That’s what I’m saying though. That’s a reason to be grateful. I completely agree with you. We need to… it’s like the old thing where once I had the blues because I had no shoes, until upon the street I saw a man that had no feet. It’s perspective. Anil Gupta: Absolutely. So, imagine this: We poop in water that people in Africa would love to drink out of. It’s the simple things. It doesn’t have to be a big thing. We have air that we can breathe. We don’t have to worry about where the next breath is coming from. We don’t have to worry about the smallest of things. It’s not the big things we need to be grateful for, it’s the small things. The green leaves, the green plants, the beautiful nature of people, the beautiful place that we live in, the freedoms that we have. Once you start building that muscle, it becomes stronger and stronger and stronger. Then you start looking for things to be grateful for, people to be grateful to. And that’s another thing, I ask people who are you grateful to? And why don’t you thank them? Jason Hartman: Very good point. It’s amazing how just appreciating those things, how literally just going outside and taking a walk, being in nature or in the city can make you grateful and just change your whole state of mind. It’s incredible, it really is. Breaking patterns – it can be done. You have some beautiful photographs on your website, and they ask some compelling questions or bring up some compelling points. You help people gain energy, gain clarity, communicate better, stop saying things that they regret later. That’s one beat oneself up concept that we do. We say something that we regret and we just replay it in our mind, and usually the other person didn’t even pay attention to it. What would you say about some of these things? Anil Gupta: Again, if you throw some awareness at it, and then ask yourself the question, what is this feeling costing me? Is it costing me my energy, my love, my enjoyment, my happiness, my joy? Ask yourself that and say look, what would happen if I could let this go? What is it stopping me from letting this go? So really, it’s just a different muscle that you just have to build and build and build. Now really, I used to be angry at the smallest of things because I just loved to be right about everything and I loved to be right about being right. And I love to make tremendous meaning around things. Now I’m an observer and I think, well that’s interesting. Someone cut me off, hmm they must be in a hurry. Without getting upset, I can just be an observer, just like in a football game without getting attached. Jason Hartman: Very good points. So observe and ask questions about the observation, right? Anil Gupta: Yeah, and also remove the attachment. Remove the attachment that you have over a circumstance or an expectation. If you expected something to happen and it didn’t, if you expected an employee to have reacted in a particular way and they didn’t, if you expected your children or your spouse to have acted in a particular way and they didn’t… it’s going to be a big cost to you. Because in that moment, you cannot love them as much as you want to. Jason Hartman: Tell us more about removing expectation. When I used to train my sales people in one of my companies years ago, I used to always say don’t be attached to the outcome – just simply go through the motions. And that seemed to be good advice in getting them to be more successful and just simply working the numbers. Increasing their failure rate if you will, by just doing more things instead of being so attached to whether or not they make the sale. If you don’t make this one, you’re getting closer to the one you will make. Anil Gupta: Absolutely true. And when you’re attached to the outcome, you won’t really enjoy the process or the journey. I was coaching someone the other day who’s a sales’ person and they make presentations and I said look, you can either be attached to the outcome and not enjoy the process, or you can enjoy the process and give yourself away. And if they don’t buy or they don’t commit, it doesn’t matter. You’ve done what you’ve needed to do, you’ve had fun and you’ve created a new feeling for the people that you’ve presented to. So you’ve already won. The sale is not the issue. The issue is: are you being authentic? Are you being truthful? Are you being yourself? Are you showing up as you want to? And if you are, you’ve got the sale. You may not get it on paper, but you’ve got the sale, my friend. Jason Hartman: Because you’ve got the experience and you’ve learned from it. And who knows how that will come back to you later? Isn’t it amazing how… you give then example of your client who makes presentations. And maybe it doesn’t generate what his or her expectation was exactly, but then a year later the boomerang comes back and that expectation actually was fulfilled. Maybe just not immediately, right? Anil Gupta: Well I’ll tell you what happened. When this young man did the presentation, the boss came up to him and said son, that was the most amazing presentation I’ve ever seen. I want you to come back and I’ll get you a bigger audience. It’s very powerful. We have no idea the impact we have on people’s lives. None whatsoever. So if you’re authentic it’s a win-win. Jason Hartman: Well it sure is. No question about it. Well, Anil give us your website and tell people where they can find out more about you and maybe just explain what it is you do. You obviously do coaching, you do presentations… do you want to elaborate on that a little bit? Anil Gupta: Sure. Really I’m what people would call a transformation relationship expert. If you have an issue in your life, I can remove it within 30-14 minutes. It’s a very special gift. My website is called ImmediateHappiness.com, my book is called Immediate Happiness. It’s available on Amazon – it’s a number 1 bestseller. But it’s not a book, it’s a manual. There’s exercises and methodologies in there that are proven that I’ve used in my webinars and seminars all over the world. So if you have an issue in your life and you’re serious about getting rid of it, I’m the man. I’m the coach’s coach. Jason Hartman: Fantastic. Good stuff. Leave us with one closing thought before you go. Anil Gupta: Okay, be grateful for the people in your life. Be grateful for what you have. Don’t focus on what you don’t have. Perform three acts of random kindness in the next day or so, and I promise you that you will feel better. The person that is affected will feel better, and it’s a muscle that you’re starting to build. So build that muscle. I promise you, compound your happiness and your life will change. Jason Hartman: Such excellent advice. Well, Anil Gupta, thank you so much for joining us today and much happiness to you and to all of our listeners. Anil Gupta: Great, thank you Jason for having me on your show.